The chance of getting one is pretty low, though. Cosmetic weapon skins are coming to PlayerUnknown’s Battlegrounds, PUBG Corp. revealed today as part of the eighth update for PUBG since its 1.0 iteration back in December. The update is now live on the game’s test server. Players there will be getting 100,000 BP, 20 Weapon Cosmetic keys, 20 Early Bird keys, and 10 Triumph Crates to help test out the new system, which will make its way to the live servers once stable. That’s right—you’ll need to get lucky via crates to get the new weapon skins. You will not be able to purchase them directly. The only way to get the skins is through the paid Triumph crate, which is a weekly random crate, or a Raider crate, which is free and non-random. The Triumph crate can also be found at a 20 percent drop rate. The Raider crate doesn’t need a key to unlock, but the skins within the crate have a pretty low drop rate, as can be seen in the image above. The named skins include Rugged Beige or Orange, Silver Plate, Jungle Digital, Trifecta, Turquoise Delight, Gold Plate, and Glory. For example, if you want the Gold Plate skin for the S686 shotgun, you will need to get a Raider crate. Once you open that crate, the skin has a 0.0064 percent chance of dropping. 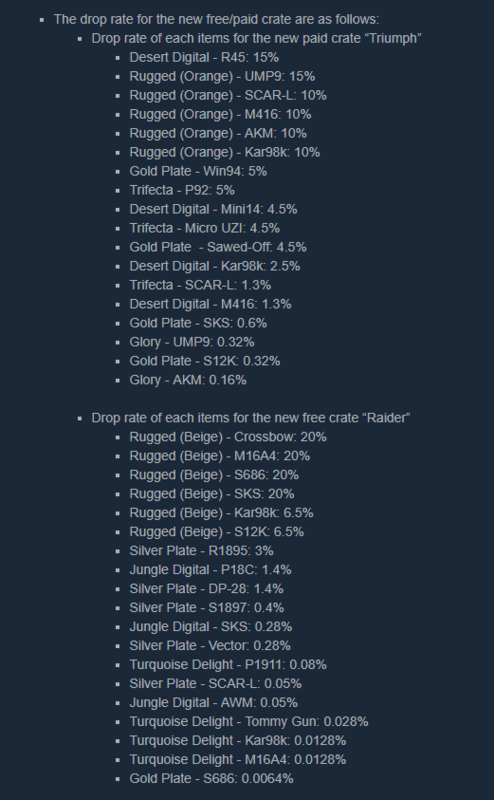 In fact, every skin that’s not Rugged Beige has a drop rate of 6.5 percent or lower in the free crate. The drop rates in the Triumph crate are not much better, with the Glory skin for the AKM dropping at a percentage of 0.16, and the Desert Digital M416 having a whopping 1.3 percent drop rate. The test server update also includes a few minor bug fixes, and the patch notes also included a foreword from PUBG Corp. about how the developer is considering locking servers to a specific region, which has been a long-requested feature. This would mean an end to the server regions options, with only the servers in a player’s region visible to them. Players would only be able to cross over if invited to a squad from a player on another server. According to PUBG Corp., this is one solution it’s considering to build on the change to ping-based matchmaking.